Is Catalonia heading toward new regional elections? 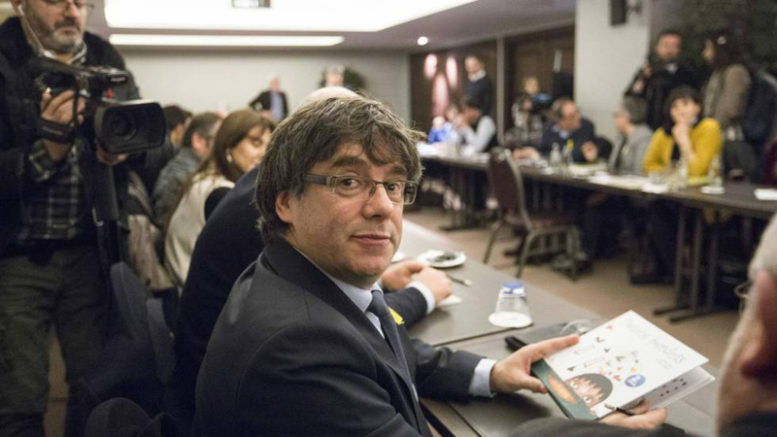 After a strategy meeting Wednesday in Brussels with legislators of his Junts per Catalunya (JxCat) movement, former Catalan President Carles Puigdemont has refused to bend to pressure from pro-independence allies Esquerra Republicana de Catalunya (ERC, Republican Left of Catalonia) and from within his own Partit Demòcrata Europeu Català (PDeCAT) party, saying he is standing behind the rapidly sinking candidacy of jailed independentista leader Jordi Sánchez to succeed him in office. After withdrawing his own candidacy from consideration in Catalonia’s deadlocked Parlament, Puigdemont annointed Sánchez as his replacement. But the jailed independence campaigner’s candidacy first was knocked back by the small anti-capitalist CUP party (Candidatura d’Unitat Popular) and then was blocked by Supreme Court judge Pablo Llarena, who has refused to release Sánchez from preventive custody to attend the requisite parliamentary debate and balloting on his candidacy. Puigdemont is being pressured on the one hand by the ERC and the leadership of PDeCAT to come up with a candidate who is not currently in jail or exile so as to effectively govern Catalonia and end direct rule of the region by Madrid, and on the other by the CUP, who want a new regional president who will declare full independence from Spain. His response after meeting with JxCat legislators in Brussels was to opt for no change, announcing JxCat will stick with Sánchez as candidate until a Supreme Court appeals panel confirms or rejects Judge Llarena’s refusal to release him. If the Supreme Court panel of judges upholds Llarena’s ruling in the coming days, Puigdemont will be forced to jettison Sánchez in favor of yet another candidate – possibly former minister Jordi Turull, who has already been all-but-vetoed by the CUP because he does not pass the litmus test of favouring all-out confrontation with the government over independence. Unless the anti-capitalist party lends its critical support or Puigdemont renounces his own seat in Parlament in favor of someone who can vote in his absence, no pro-independence candidate will be able to secure election. If the drawn-out parliamentary election process in Catalonia stalls on that point, or if Spain’s Constitutional Court rules first on a Socialist party (PSC-PSOE) request for an injunction to place a time limit on the process, Catalonia’s pro-independence movement could well be forced to accept as its last available option a return to the ballot box with another regional election in the coming weeks.